This is a really well researched book, giving a fascinating account of a man I never knew existed. A thoroughly enjoyable read. The History Press recently invited me to write a piece about Monte Carlo and the origins of the casino for their monthly newsletter, which is out today. You can sign up to receive every edition of the History Press newsletter here. A factor that has shaped my writing style is my work as a radio producer and script-writer: this was my full-time occupation for over ten years and something I am still engaged in, though to a lesser extent than in the past. A rule when writing for radio is to write as people speak. So “it is” becomes “it’s”; “does not” becomes “doesn’t”. In everyday speech sentences don’t always have verbs. Really. But although radio scripts are better when they closely follow the way we speak, this principle should be used in moderation in a factual book. If overdone, it is likely to irritate the reader. In matters of vocabulary, I prefer to err on the side of simplicity. Few of us know the meaning of the words “imbricate”, “mangonel” or “zymurgy” and authors who manage to shoe-horn them into their writing are either crediting us with a wider vocabulary than we actually have or – more likely – are simply showing off. And I feel the same way about writers who use Latin and Greek phrases and sayings. As a schoolboy (long ago!) I had to study Latin, most of which I have never had to use and have now forgotten. Greek was not taught at our school. And a knowledge of these languages is even rarer today. So remember, using obscure language is contra bonos mores — (contrary to good manners)! After his unfavourable first impressions of Britain, Henry Metelmann also came to see things in a different light. The turning point came when he was being moved to a camp near Romsey, Hampshire, and watched the countryside rolling by as he gazed out of the train window. ‘In many ways England was a strange country. That narrow channel of water seemed to have made much difference over the centuries. Most things seemed small and old-fashioned. The rows and rows of houses in the towns, with their small backyards and gardens, seemed cramped. The people were friendly enough, but strangely reserved, and life generally had an unhurried flow, so very different from America and the Continent of Europe. And yet, there was something likeable about it all … Those [prisoners-of-war] who lived out on the farms had very good relations with the farming people, and on the whole were treated very well … I was transferred to an out-camp in a beautiful old country house called Hazelhurst, near the village of Corhampton. It did me much psychological good, as it gave me a feeling of freedom which I had not had for many years.’ [From Hitler’s Last Army, page 201]. 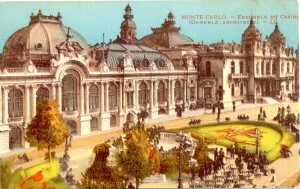 While I was writing The Man who Broke the Bank at Monte Carlo I found it difficult at first to picture the layout of the Casino when Charles Wells went there in 1891-2. 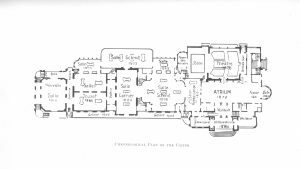 Then I discovered this plan in a book from 1912: it shows how the building was expanded over the years by adding new extensions. The centrally-located Salle Schmit dating from 1898 is probably where Wells broke the bank at roulette on his first and second visits (in July-early August, and early November respectively. It was known at the time as the Salle Mauresque — ‘the Moorish Room’ — a reference to its Eastern décor). The Salle Garnier (shown here to the left of the Salle Schmit, and named after architect Charles Garnier) was principally used for the card game of trente-et-quarante, which Wells also played sometimes. The Salles Touzet — still further to the left — were begun in 1889, but were closed during both of Wells’ 1891 visits so that finishing touches could be applied to the decorations. They were re-opened immediately after the second of his forays. (See The Man who Broke the Bank at Monte Carlo, especially pages 62-65, 83-86 and 231-235). My recent interview with Lynn Briggs on 105 Uckfield FM is now available to listen to on the home page of Uckfield FM.